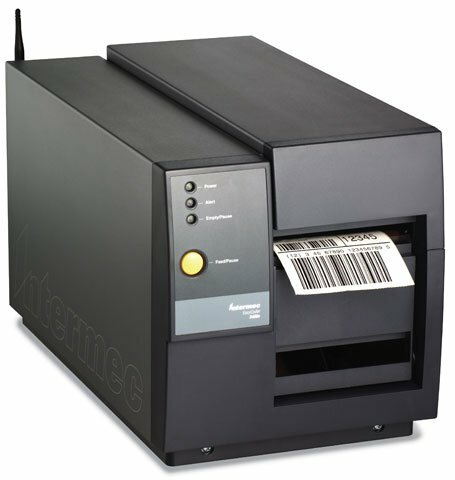 It is replaced by the Intermec EasyCoder PM4i. Thermal transfer, 203 dpi, 6 ips, 4.5" print width, parallel & serial interfaces. Includes US power cord. Order cables separately. See accessories. Thermal transfer, 203 dpi, 6 ips, 4.5" print width, wireless 802.11b interface. Includes US power cord & peripheral kit. Order cables separately. See accessories. Thermal transfer, 400 dpi, 6 ips, 4.5" print width, Ethernet interface. Includes US power cord & peripheral kit. Order cables separately. See accessories. Thermal transfer, 203 dpi, 6 ips, 4.5" print width, Ethernet interface. Includes US power cord. Order cables separately. See accessories. Thermal transfer, 203 dpi, 6 ips, 4.5" print width, Ethernet & serial interfaces. Includes US power cord. Order cables separately. See accessories. Thermal transfer, 203 dpi, 6 ips, 4.5" print width, twinax & serial interfaces. Includes US power cord. Order cables separately. See accessories.